The sun is shining and the birds are singing, it’s going to be a great day and you’re filled with optimism and hope for the future, you just need the perfect sound track to make everything complete. Enter ‘Happy Background Music V1’, the ultimate ‘feel good’ music pack of royalty free tracks for your latest upbeat projects. With happy background music tracks like these, your projects will be bursting at the seams with pure positivity, ready to take on the world. When your project calls for glee and jubilation, this music pack is your best buddy. 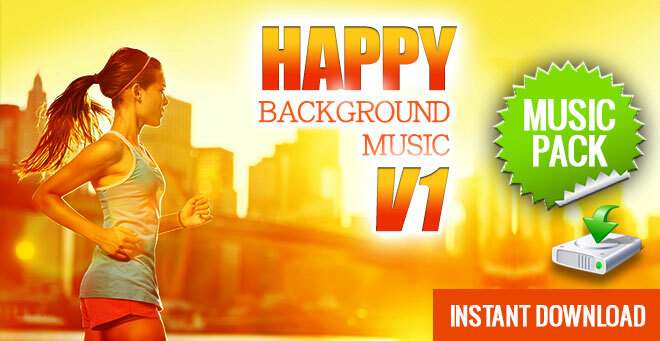 In just a few clicks you can download ‘Happy Background Music V1’ and finish your sound track in style. We put together six shiny, happy tunes that are ready to be synched up to your latest video presentation, commercial, voice-over bed, podcast and pretty much any audio visual medium you care to think of. Have a quick glance at the list of suggested uses in the side bar to the right, you’ll see what’s covered with the standard royalty free music license you get when purchasing this product. If you don’t see what you need, get in touch. These 6 happy background music tracks feature instrumental music that you can just drop right into your latest project for the ideal musical score. The tracks in this music pack feature plenty of live acoustic instruments as well as more electronic sounds to keep things interesting. You’ll get to download your Music Pack immediately after completing your purchase. We provide download links to the 6 tracks in both MP3 and WAVE file format to ensure that you get the best in sound quality and convenience. When you purchase this happy background music pack, you’ll get to download the files right away. It’s really simple to order and download your sounds so you can get back to working on your project. Download ‘Happy Background Music V1’ today and spread the joy in your presentation.